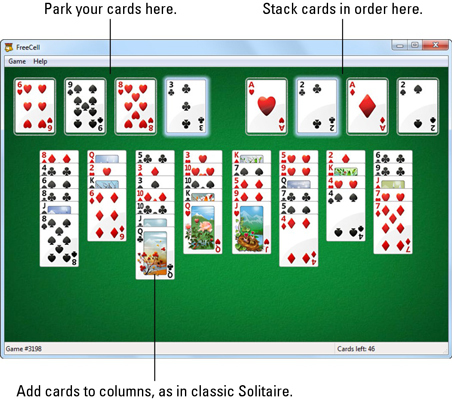 FreeCell, Microsoft’s first Solitaire variant, mimics the card game of the same name. Game play in FreeCell resembles “regular” Solitaire in many ways, as you use the cards to build suit stacks and sequential columns of cards in alternating colors. Yet, most people don’t know that there are game cheats available to help them boost their FreeCell player statistics in Windows 7. To start playing FreeCell, choose Start→Games and double-click the FreeCell icon. To move cards, just click the card, then click the new location. If you get stumped, you can always ask for help by pressing the H key. However, like Solitaire, FreeCell’s help isn’t always helpful, but if you like the help you’re given press Enter, FreeCell makes the recommended move for you. Many people think that you can only move kings to empty column on the table, but you can actually move any card to an empty row. One of the ways FreeCell lets you impress your friends is by replaying the same hands over and over until you’ve mastered it. You can play that same hand in front of your friends and show them just how talented you are. To replay a hand, choose Games→Select Game, type the number of the hand, and click the OK button. This trick also allows you to play the same hand in multiple locations or to challenge a friend on a different machine to a duel. Windows 7 supports hands numbered from 1 to 1,000,000 for FreeCell. Only hands 11,982, 146,692, 186,216, 455,889, 495,505, 512,118, 517,776, and 781,948 are unwinnable. FreeCell keeps track of how many hands you win and lose, and the length of your current winning (or losing) streak. To see the scores, choose Game→Statistics. The primary way to cheat in FreeCell is to trick the scoring system. FreeCell includes four not-so-hidden symmetrical hands, numbered –1, –2, –3, and –4. Games –1 and –2 can’t be won. Games –3 and –4 win all by themselves. What’s the easiest way to run up your winning statistics? Play a whole bunch of games using hands –3 or –4. (Choose Game→Select Game, and select –3 or –4). Simply drag an ace onto one of the suit stacks and wait for the cards to start crashing against the bottom of the screen. If you’ve been playing for ages, and you’re completely fed up, you can opt for an instant win. Press Ctrl+Shift+F10 to bring up a dialog box that says “User-Friendly User Interface.” Click Abort, then move any card, and you instantly win. Click Retry, you lose the game, and Ignore cancels the dialog box. 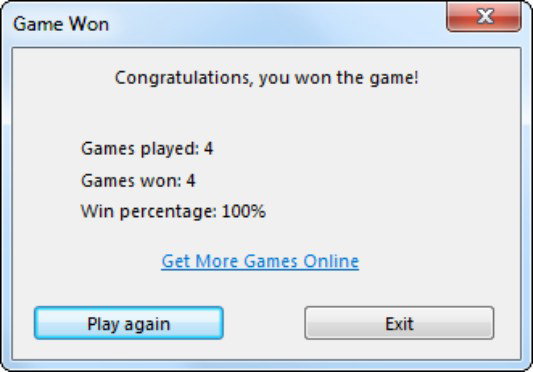 Since FreeCell is so hard, it’s nice to see what winning looks like.